Play together in your living room or across the world! Rock Band offers deep online functionality, allowing players to rock together whether they’re in Rhode Island or Reykjavik. Major record labels and leading music publishers have signed on to provide unrivaled access to master recordings and legendary rock artists – from punk, metal and alternative to classic and southern rock. Rock Band ships with 45 fearsome tracks from artists like Bon Jovi and The Ramones to Black Sabbath and Stone Temple Pilots. Full support for downloadable content delivers never-ending challenges. New content will be available every week. Download full albums for play with Rock Band including the iconic rock album 'Who's Next' by The Who. Metallica has signed on to offer several tracks as digitally-distributed game levels for Rock Band as well as "Enter Sandman" for the Rock Band ship disc. Create your own rock avatar! Mold a unique rocker using Rock Band's character creator. Choose from gender, body shape, face, hair, clothes, tattoos and signature moves. Don't forget to pick your specialized rockin’ instrument. Drumming in the spotlight! 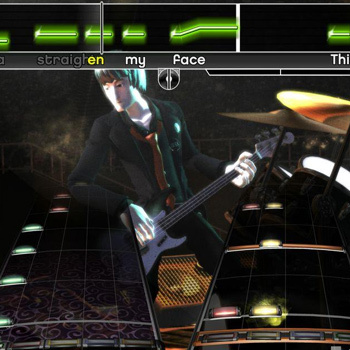 Showcase a real drum solo with Rock Band's freestyle drum fill windows featured in each song. Break out your own rhythm and style as anything goes! Vocalists can bring the crowd to their feet during Rock Band’s freestyle vocal fill windows. Ad-lib your own words or shout to the crowd to raise the rock intensity of the performance. Band mates can fail out of a song for poor performance, but the band still plays on. Rescue your failing mate by busting out signature moves and blistering solos to wow the crowd with showmanship. Earn bonus points for your band during Rock Band’s Unison Phrase opportunities if everyone plays perfectly.